Electric fuse are item to start a monument puzzle by activating the electricity to get green, blue card and red card. And of course you can get good loot after that. 1. Wait (camp) for someone to put fuses in at launch site (any puzzle monument). 2. Remove the fuse as soon as they leave, wait for them to come back in a hurry. 3. ?????????? 4. PROFIT! 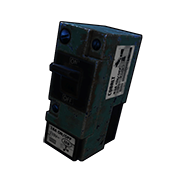 Fuses can be sparingly drained, meaning only use them for as long as you need/care to then retrieve them. Extra fuses can be recycled for a handsome amount of scrap.